This view shows the Borexino stainless steel sphere. 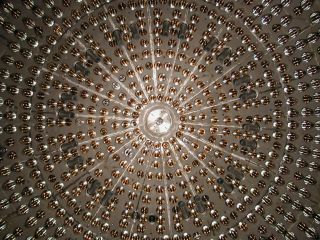 The experiment made the first measurements of the difficult-to-detect solar neutrinos that power the sun. Tiny particles forged in the heart of the sun have been detected for the first time, offering scientists a glimpse into the nuclear fusion core of our closest star. The subatomic particles, called neutrinos, are hallmarks of the dominant fusion process insidethe sun. Created in the first step of a reaction sequence responsible for the majority of the sun's fusion, the particles have long eluded detection. Now, an international collaboration of more than 100 scientists working with the Borexino detector in Italy has made the first measurements of these elusive particles. This image shows the Borexino prototype. The experiment is designed to detect elusive particles like neutrinos. Stars are giant fusion reactors, smashing protons together to produce energy. See how the heart of the sun works in this Space.com infographic. Along with light, the sun streams neutrinos from its core out into space, bombarding a square inch of the Earth with about 420 billion particles per second. Although numerous, the low-energy neutrinos created through the proton-proton (pp) fusion process only interact with other material through the weak nuclear force, making their detection a challenge. The first step in the dominant fusion process in the sun starts when two protons in its core fuse into a deuteron, creating a pp neutrino. Other neutrinos are created in subsequent steps of the process, several of which have been detected, but the first-step neutrinos remained elusive. "They are the most direct confirmation that nuclear fusion is the source of energy [for the sun]," Wick Haxton, of the University of California, Berkeley, told Space.com. Haxton, a theorist who studies neutrino and nuclear astrophysics, is not a part of the Borexino collaboration. Scientists have sought to establish that the rate of energy generation at the solar core is consistent with the light shining from its surface. Neutrinos inside the heart of the sun take 100,000 years to reach the stellar surface before rushing outward at the speed of light. Comparing the sun's energy emitted as the sun's light with the energy from the core reveals information about the thermodynamic equilibrium of the star over tens of thousands of years. "This measurement directly confirms what we know about fusion processes in the sun from higher energy neutrinos and what we see from the surface of the sun," Pocar said. Scientists studying the sun have detected solar neutrinos forged in the star's heart for the first time. This infographic depicts how the discovery was made using the Borexino detector in Italy. The new findings also reveal more about the nature of neutrinos themselves. The particles come in three types, or "flavors." Those streaming from the solar core are "electron"-flavored. As they travel through space, they shift between "muon" and "tau" types. Combined with previous solar neutrino measurements, the Borexino experiment strongly confirmed the nature of the particles. So far, such effects have been seen only on the sun, Haxton said. The same effect can be used on Earth in so-called long-baseline neutrino beam experiments, which seek information about the complete ordering of neutrino masses. "It is important that we establish that we understand matter effects in the sun before using this effect to determine something as fundamental as neutrino masses," Haxton said. The research was published online today (Aug. 27) in the journal Nature, along with Haxton's corresponding News & Views article. An up-close-and-personal view of the Borexino experiment, which made a direct detection of neutrinos from the sun for the first time. Buried beneath Italy's Apennine Mountains, Borexino is shielded from the cosmic rays that interfere with detection of pp neutrinos by nearly a mile (1.4 kilometers) of rock. The onionlike layers surrounding the instrument, combined with its depth, make it the most radiation-free medium on the planet. Surrounded by 300 tons of liquid, the 2,200 sensors within the tanks capture interactions of the neutrinos with the material. The liquid resembling benzene is derived from some of the oldest petroleum found on the planet as part of an effort to eliminate the presence of carbon-14, whose decay covers up neutrino signals. Although most of the carbon-14 in the ancient material has decayed, the scientists continue to refine the process. "They did years of work to make the detector pure, eliminating trace amounts of radioactivity," Haxton said. Contamination for the recent detections was reduced to less than 1 part per billion billion, he said. Borexino continues to make detections of pp neutrinos on a daily basis. Pocar expressed his interest in attempting to measure the product of the carbon-nitrogen-oxygen (CNO) cycle that makes up the remaining 1 percent of solar reactions. Though responsible for only a fraction of the fusion process in the sun, the CNO cycle dominates in massive stars with hotter cores. The Borexino detector appears to glow green when filled with ultra-pure water. Currently, scientists can deduce the amount of elements other than hydrogen and helium—what astronomers term as metals—at the heart of the sun, but they cannot directly measure it. These measurements indicate that the core is relatively rich in elements such as carbon and nitrogen, while the outer shell is metal-poor. The metallicity of the two are related in the standard solar model, which assumes that the sun was homogeneous when it first formed. "Such a measurement directly probes the metallicity of the core," Haxton said. Measurements of the interior could have implications for planet formation. According to Haxton, one theory is that the planets may have extracted a lot of the metal from the solar disk as the sun formed. "We might learn that a star's surface metallicity is altered if that star harbors planets," Haxton said. Such information could have an impact on how exoplanet hunters select their target stars.